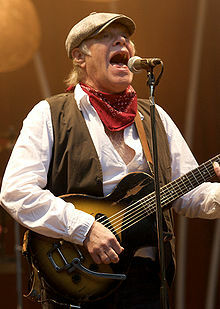 Kim Melius Flyvholm Larsen (23 October 1945 – 30 September 2018) was a Danish rock musician. He was a major selling Scandinavian act as he sold over 2.5 million albums. In 1979, Larsen participated in the Danish stage of the Eurovision Song Contest with the song Ud i det blå (en: Out in the Blue). He came third out of 17 participants. The song was included on this album 231045-0637. Larsen died of prostate cancer at his home in Odense on 30 September 2018, aged 72. ↑ Jørn Jeppesen (2018-01-03). "Vinterturné aflyses". Kimlarsen.dk. Retrieved 2018-01-03. ↑ "CBS Records present: Major Scandinavian Acts". Billboard. 14 July 1979. Retrieved 1 October 2018. ↑ Busk Stie, Hans-Henrik (30 September 2018). "Kim Larsen er død". Nyheder.tv2.dk (in Danish). This page was last changed on 2 October 2018, at 15:47.